I am rubbish at decorating cakes, I lack patience and a steady hand, so when I found these cute little edible toppers from My Cupcake Toppers I thought they would be the perfect thing to jazz up my festive bakes. They do loads of designs (not just festive themed ones), you can even create your own! You can now also get 10% off your first order by using BREAD10 at the checkout. Line a 12 hole muffin tin with cupcake cases. Place the flour, egg, butter, sugar, baking powder, orange zest, mixed spice and white chocolate into the bowl of a freestanding mixer and mix using the paddle attachment until everything is well combined (you could use a hand-held mixer instead). Spoon the mixture into the cupcake cases, filling them about 3/4 of the way up. Bake the cupcakes for around 15 minutes, or until they have turned a light golden brown and are springy to the touch. Remove the cakes from the tin and place them on to a wire rack to cool completely. Make the icing by beating together the icing sugar, milk, unsalted butter and orange zest together in a freestanding mixer using the paddle attachment, until everything is well combined and the mixture has become white and fluffy. When the cakes have cooled, make a hole in the centre, making sure you don't go straight down to the bottom (see picture, I used an apple corer but you could just use a teaspoon if you haven't got one). Place a teaspoon of marmalade into each of the holes until all of the cupcakes are filled. Using a small palette knife (or the back of a spoon) smooth the icing over the cupcakes, making sure you can't see any of the cake underneath. Place a cupcake topper on top of each of the cakes and then sprinkle with the edible glitter. These cupcakes will keep for a couple of days stored in an air-tight container at room temperate. A white chocolate mocha is definitely my coffee shop drink of choice. I have heard whispers off this festive flavoured twist on secret menus for a while now, but I have never dared stray from my usual order to try it myself. I have used peppermint cordial here instead of essence, after a disaster with an out of date bottle, but if you want to use essence, I would reduce the quantity to half a teaspoon. Heat the milk, coffee and peppermint cordial on the hob, on a medium heat, until the milk just starts to bubble (make sure you stir well so that everything is combined). Remove the milk mixture from the heat and leave to cool slightly, for around 30 seconds (because the white chocolate is very sensitive to heat). Place the white chocolate into a large heat-proof bowl. Pour the milk over the chocolate and stir well until all the white chocolate has melted and everything is well combined. Pour the mocha into a mug and enjoy! These deliciously sweet rolls combine all the nostalgic flavours of the festive season. The above-mentioned treats taste best whilst still a little warm, served alongside a mug-full of lightly spiced mulled wine. Place the flour into a large bowl and rub in the butter using your fingertips, until the mixture resembles fine bread crumbs. Rub the yeast into the bread crumb mixture. Add the salt, mixed spice and milk and combine until the mixture forms a dough (adding more milk if it feels a little dry). Place the dough onto a lightly floured surface and knead for around 10 minutes, or until it feels soft but not sticky. Place the dough back into the bowl, cover with a tea towel and leave to rise for about an hour and a half, or until it has doubled in size. When the dough has doubled in size, tip it out onto a lightly floured surface. Roll the dough out into a large rectangle (about 20cm x 30cm). Roll out the marzipan so it’s the same size and shape as the dough. Place the marzipan on top of the dough and then spread over the mincemeat, mixed peel, almond nibs and orange zest. Roll the dough up into a large sausage and then cut it into 15 equal pieces. Line a rectangle baking tray with some grease proof paper, and then place the dough pieces on it, leaving 2 cm (ish) gap between each one. Cover the buns with a tea towel and leave to rise for about an hour, or until they have noticeably puffed up and are pretty much touching. When the buns have risen, bake them for around 20 minutes, or until they have turned a deep golden brown. Leave the buns to cool in the tray for around 10 minutes before liberally dusting with icing sugar and serving. After the success of my last marmite themed bake I thought I would try something else, this time including it in a delicious Mediterranean classic and adding a little extra cheese (because cheese makes everything better). I may have offended some Italians by calling this a 'focaccia' but it its baked in the same way and drenched with olive oil, all that's missing is an adornment of sea salt (I figured the marmite was salty enough). Enjoy this bread whilst its still slightly warm, dunked into some piping hot soup. Add the marmite, salt, oil, parmesan and water and mix to form a dough (adding more water if it feels a little dry). Place the dough onto a floured surface and knead for around 10 minutes, or until it feels smooth and elastic. Return the dough to the bowl, cover with a tea-towel and leave to rise for about an hour, or until it has doubled in size. Grease a rectangle baking tray and pre-heat the oven to 200 degrees C.
When the dough has risen, place it in the baking tray, stretching it out so that it pretty much fills the entire tin. Cover with a tea-towel and leave to rise again, for around 20 minutes, or until the dough has noticeably puffed up. When the focaccia has risen, make lots of dents in the surface with your knuckles, then sprinkle over the cheese and olive oil. Bake for around 20 minutes, or until the cheese is burnished and the crust is a deep golden colour. Cool the focaccia in the tin, for around 10 minutes, before removing and serving. I got the inspiration for this bake from my friend Jonny, who once made me some flatbread that was stuffed with either sweet potato or butternut squash (I can't remember which one), and it tasted AMAZING. Ever since I tried his creation I have been thinking of ways that I could combine the delicious, earthy flavour into my own breads. I have always been a fan of potato topped focaccia (Jamie Oliver does a good one) and I thought a little twist on the classic Italian flatbread would be the perfect carrier for my spiced sweet potato mixture. Add the salt oil and water and combine until the mixture forms a dough (adding more water if it feels a little dry). Place the dough onto a lightly oiled surface and knead for around 5 minutes, or until it feels more smooth and elastic. Place the chopped sweet potato onto a baking tray. Sprinkle over the paprika, chilli flakes, 1 tablespoon of the olive oil and 1 tablespoon of the sea salt and mix together so that the sweet potato is evenly coated. Bake the seasoned potatoes in the oven for around 20 minutes, or until they are soft. When the sweet potatoes are ready, remove them from the oven and place to one side to cool. Grease two 20cm round cake tins with olive oil. When the dough has risen, divide it into two and place it into the lined cake tins. Press the cooled sweet potato into the doughs and then cover each one with a tea towel. Leave the doughs to rise for around 30 minutes, or until they have noticeably puffed up. When the loaves have risen, sprinkle over the remaining olive oil and sea salt and bake for 20 minutes, or until they have turned a deep golden brown. Leave the focaccia to cool slightly on a wire rack before removing from the tins and serving. The focaccia can be frozen, if you are not planning to eat them straight away (this is why I made two, so I could eat one now and freeze the other for later), simply cool completely and then wrap well in clingfilm before freezing. When you are ready to eat the focaccia simply bake them straight from frozen, at 180 degrees for 10 minutes. This dark, dense loaf is packed full of tasty nuts and seeds and would make a great addition to any Christmas cheese board. It also tastes amazing toasted, simply slather with butter for a deliciously warming winter snack. Add the oil, salt, sultanas, nuts and seeds and mix until everything is well combined. Add the water and bring together until the mixture forms a dough, you may need to add a little more water if it feels dry. Tip the dough out onto a lightly oiled surface and knead for around 5 minutes, or until it feels a little smoother. Leave the dough to rise for a couple of hours, or until it has doubled in size. Line a 1lb loaf tin with baking paper or a loaf tin liner. When the dough has risen, place it onto a lightly oiled surface and shape into a rectangle, just slightly smaller than the loaf tin and then place it inside the lined tin. Cover the dough with a tea towel and leave to rise for an hour, or until it has noticeably puffed up. When the loaf has risen, bake it for 40 minutes, or until the top has turned a deep golden brown and the base sounds hollow when tapped. Remove the loaf from the tin and allow to cool completely on a wire rack before slicing and serving. This loaf will keep for up to a week, wrapped well in baking paper and stored in a cool, dark place. These sweet, coconut-y rolls are essentially a Bounty chocolate bar served up in bread form. Enjoy as part of a treat filled weekend breakfast or simply as a naughty afternoon pick me up. Add the salt and milk and combine until the mixture forms a dough (adding more milk if it feels a little dry). Make the filling by mixing together the condensed milk, icing sugar and desiccated coconut. Roll the dough out into a large rectangle (around 20cm x 30cm) and then spread over the chocolate spread and then the coconut mixture. Cover the buns with a tea-towel and leave to rise for about an hour, or until they have noticeably puffed up. Leave the buns to cool completely in the tin before drizzling with the remaining chocolate spread and serving. I am not going to claim that I invented the peanut butter/chocolate/pretzel mash-up, this recipe just happens to be my take on the trend. Salty and sweet, these bites are deliciously naughty and moorish. Serve as a late afternoon snack for a mouthwatering pick-me-up. Makes around 20 small squares. Line a 20 x 30cm rectangle baking tin with cling-film. Place the biscuits, pretzels (bar the ones saved for decoration) and melted butter into a food processor and blitz until the mixture resembles coarse, wet sand. Press the sandy mixture into the prepared tin, smoothing in down until it evenly fills the entire tray. Place in the fridge for 30 minutes to set slightly. When the base is set, mix together the condensed milk and peanut butter, in a bowl, until they are well combined. Pour the peanut butter mixture over the base, smoothing it down as you go, so that it evenly covers the biscuit mixture. Place the tin in the fridge for around 30 minutes, or until the peanut butter mixture has set slightly. When the sweet, nutty layer is a little firmer, melt the dark chocolate and pour it on top. Melt the white chocolate and blob it on top of the dark chocolate at random intervals. Take a cocktail stick and swirl the two chocolates together, so that you get sort of a ripple effect. Place the extra pretzels on top of the chocolate. Place the tin in the fridge to set, for around 2 hours, before slicing and serving. These squares will keep for up to a week in the fridge, just make sure you store them in an air-tight container (chocolate tends to take on the flavour of things around it if it's not wrapped up well). This treat came about because I wanted to create a spiced winter dessert that combined my love of gooey, rich, sticky toffee pudding and gloriously sharp cooking apples. For best results serve this bake warm from the oven, with a generous dollop of ice cream on the side. This cake will keep for a couple of days in the fridge, wrapped up well in tinfoil. Makes 1 cake, serves 8. Place the dates into a bowl and pour enough boiling water over to just cover them. Leave the dates to soak for around 20 minutes, or until they have noticeably plumped up. When the dates have soaked, place them, and their water, into a food processor and blitz until the mixture is smooth. Line a rectangle high sided baking tin (around 20cm x 30cm) with baking paper. Slice the apples into small-ish chunks. Place the flour, baking powder, spice, vanilla, eggs, butter and sugar into the bowl of a standalone mixer and beat, using the paddle attachment, until the mixture is smooth and well combined (you could use a hand-held electric whisk too). Fold the chopped apples and the date mixture into the batter and then pour into the prepared tin. Bake the cake for around 30 minutes, or until the top is a deep golden brown and a knife comes out clean when inserted into the centre. Leave the cake to cool a little in the tin before slicing and serving. After the success of my 'Pizza Focaccia', I wanted to carry the moreish flavour into another savoury bake. These rolls make a delicious accompaniment to a soup or a saucy stew, just make sure you serve them warm, whilst the cheese is still stringy and oozing. Add the salt, oil and water and mix until it forms a dough (adding more water, if it feels a little dry). When the dough has risen, place it onto a lightly oiled surface and roll into a rectangle (around 20cm x 30cm). Spread the sun-dried tomato puree evenly over the dough and then sprinkle over the dried basil. Roll the dough up into a large sausage shape and then cut the sausage into 12 equal pieces. Grease a 12 hole muffin tin with olive oil and then place the dough pieces into each of the holes. Push a mozzarella ball into the centre of each of the rolls and then cover the entire tray with a tea towel. Leave the rolls to rise for around half an hour, or until they have noticeably puffed up. Pre-heat the oven to 190 degrees c.
When the rolls have risen, bake them for around 15 minutes, or until they are a light golden brown and the cheese is molten. Leave the rolls to cool for 5 minutes in the tin, before carefully removing and serving. Cut a criss-cross pattern into the loaf with a sharp knife, making sure you don't quite slice all the way through. Place a piece of cheese into each opening on top of the loaf, trying to alternate evenly between each cheese. Stir the pesto and the olive oil together and then drizzle on top of the cheesy mound. Place the bread onto a lined baking tray and cook for around 15 minutes, or until the cheese has gone a deep golden brown. Leave to cool on the baking tray for a couple of minutes before serving. I have seen 'porridge bread' popping up everywhere in the last few weeks. From artisan bakeries to food bloggers, everyone seems to be putting this breakfast staple into their loaves, and as I love combining oats into my bakes, I thought I would jump on the bandwagon and give it a go. During my first attempt at coming up with a recipe for this new trend, I added wayyy too much porridge, making the dough very hard to handle, and the texture of the finished loaf very dense. This version uses a little less porridge than my previous endeavours, but still manages to keep that creamy oaty texture. I have made two medium loaves here, but you could combine them and just make one very large bake, if you wanted. Make the porridge by heating the oats and water in a pan on a medium heat, stirring until all the water has absorbed and the oats have gone all creamy. Take the porridge off the heat and leave to cool completely. Once the porridge has cooled, make the loaf by placing the flour into a large bowl and then rub in the yeast. Add the porridge, salt, oil and water and mix until it forms a dough (adding more water if it feels a little dry). Tip the dough onto a lightly floured surface and knead for around 10 minutes, or until the dough feels smooth and more elastic. When the dough has risen, divide it into two equal pieces and roll each piece into a ball. Place the balls onto a lined baking tray (leaving plenty or room between each one) and cover with a tea towel. Leave the loaves to rise for about an hour, or until they have noticeable puffed up. When the loaves have risen, dust them with a little flour and make some slashes in the top with a sharp knife. Bake the loaves for around 25 minutes, or until their crusts are a deep golden brown and the bottom of each one sounds hollow when tapped. Cool completely on a wire rack before slicing and serving. 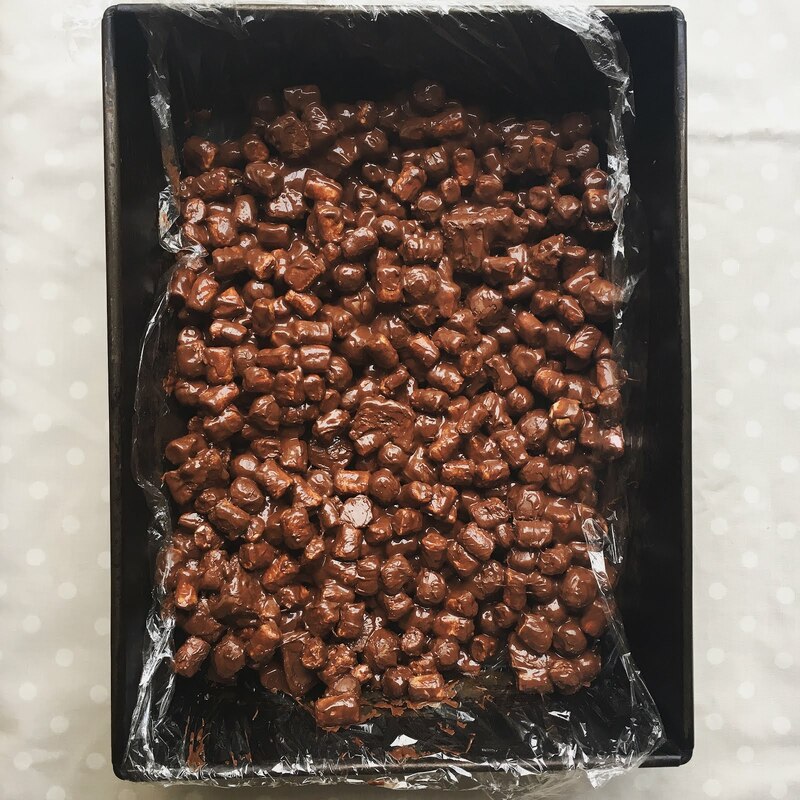 I have only gone and made a video for my Trick or Treat Rocky Road recipe! These rocky road squares are a great way of using up any left-over goodies that your trick or treater's haven't taken. So quick and easy, these chocolatey delights take a matter of minutes to put together and are great to make with children (as there is no actual baking involved). 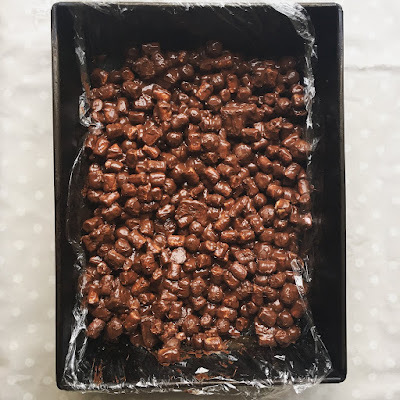 I have used a selection of my favourite confectionary in this recipe, but feel free to use whatever left over loot you have lying around (sweets, chocolate and biscuits will all work well here), just make sure that you have enough melted chocolate to cover everything evenly. Place the treats, marshmallow and broken biscuits into a large bowl. Pour the melted chocolate into the treats and stir until everything is well combined. Place the chocolate/treat mixture into a medium rectangle baking tin, that has been lined with clingfilm. Smooth the mixture into the sides of the tin and then place in the fridge, for at least two hours, until it has set. When the rocky road has set, dust it with a little icing sugar and then cut into large squares. This sweet treat will keep well in an air-tight container, for about a week ( that's if it lasts that long!). Last week I was lucky enough to spend an evening with Jenny Chandler, the food writer, teacher and UN FAO special ambassador for pluses. She was showing us how to cook some easy and delicious dishes using beans and lentils, which are among some of the most sustainable crops you can find and have been feeding people world-wide for centuries. I have been a fan of pluses for a while now, as someone who does not eat meat, and they more accessible than ever these days, often coming pre-cooked and soaked so all you have to do is open the packet and enjoy. I almost assumed before the event that Jenny was a vegetarian, because, why else would you be pushing lentils when the rest of the cooking world is meat mad? It turns out Jenny is not a herbivore, but someone who just loves the taste of these ancient food sources and is really passionate about promoting their nutritional value through delicious recipes. It was a really refreshing evening, with the focus on tasty food that you could enjoy every day. What we ate - Jenny cooked us falafels (the best I have ever eaten, she cooks her's with fava beans instead of chickpeas) and quesadillas with re-fried beans and Mrs Kirkham's Lancashire cheese. The falafels were so quick and easy, simply put all the ingredients into a processor and blitz, and nothing like the dry/flavourless ones I have had in the past from supermarkets. The quesadillas were spicy and moorish, a quick and easy dinner that I have already made twice since attending the class! If you want to find out more about Jenny and her recipes, head down to Borough Market every Thursday in November, where she will be cooking delicious pulse dishes from around the world. Jenny will be cooking at the demo kitchen in Borough Market every Thursday in November, 12.30pm - 2pm. Something to serve your falafels with - Chill and Oregano Pitta Bread. Add the salt, water, oregano, oil and chilli and mix until it forms a dough (adding more water if it feels a little dry). When the dough has risen, place it onto a lightly oiled surface and divide it into 6 equal balls. Roll out each of the balls into a long oval shape, about the length between your wrist to your elbow. Place the pittas on to 2/3 lined baking trays, leaving a small gap between each one. Bake the pittas for around 5 minutes, or until the middle has puffed up and they are a pale golden colour. Leave the pittas to cool for a minute on a wire rack before serving. I got the inspiration for this bake whilst having breakfast at a quiet bakery in Covent Garden. They were serving these orange chelsea buns, which were deliciously sticky and sweet, and once I tasted one, I knew I was going to have to try and make my own version at home. I have added mixed spice to my buns, because I like the warmth that it brings on a cold autumn day. Enjoy these treats with a large cup of tea, as a late afternoon pick-me-up. Whilst the dough is rising, make a creme patisserie for the filling. Place the yolks and sugar into a large bowl and whisk together until pale. Add the flour and orange zest into the egg mixture, stirring until there are no lumps. Heat the milk and vanilla, in a pan over a medium heat, until it just starts to boil. Take the pan off the heat and pour half of the milk into the egg mixture, stirring well until it is fully combined. Stir the rest of the milk into the egg mixture and then place it all back in the pan. Put the pan back on the heat, and stir until the mixture goes thick and gloopy (you may have to whisk it a little if lumps start forming). When the mixture has thickened, place it into a large bowl and cover with clingfilm (making sure that the cling film directly touches the creme patisserie, to avoid a skin forming), then leave to cool completely. Roll the dough out into a large rectangle, and then spread the cooled creme patisserie and marmalade across it. Roll the dough up into a large sausage and then cut it into 10 equal pieces. Make the glaze by mixing together the marmalade and the boiling water. When the buns are ready, brush over the marmalade glaze and leave them to cool in the baking tray, before serving. Autumn is here!!! which for me means cozy nights in, knitted socks and warm, spice scented comfort food. These teacakes take their inspiration from my Lady Grey Tea Bread, which I wanted to make, but in a different form, and nothing is better on a crisp autumn morning than a hot buttered teacake. I have made my teacakes quite big, partly because I am greedy and partly to remind me of the ginormous ones I used to get at school, so feel free to make 8 slightly smaller ones, instead of 6, if you wish. Makes 6 very large teacakes. Heat up the milk in a small sauce pan on a medium heat, until it just starts to bubble. Remove the milk from the heat and add in the 6 tea bags. Give the milk and tea bags a good stir, and then leave to infuse for about an hour, or until the milk has completely cooled. When the milk is cool, place the flour into a large bowl and rub in the butter, until the mixture resembles fine bread crumbs. Rub the yeast into the bread crumb mixture and then mix in the salt, mixed spice and currants. Remove the tea bags from the milk and then add the milk to the rest of the ingredients, mixing until it forms a dough (adding a little water if it feels a bit dry). Return the dough to the bowl, cover with a tea towel, and leave to rise for about an hour and a half, to until it has doubled in size. When the dough has risen, divide it into 6 equal (ish) pieces and the roll each piece into a ball. Place the balls onto a lined baking tray, cover with a tea towel and leave to rise for around 30 minutes, or until they have noticeably puffed up. When the teacakes have puffed up, place them into the oven for around 15 minutes, or until they have turned a deep golden brown. When the teacakes are done, place the baking tray onto a wire rack and then brush the teacakes with a little butter. Cover the buttered teacakes with a tea towel and leave them to cool (this will help keep them to stay nice and soft). These teacakes will keep well for a couple of days, wrapped and placed in a cool dark place (not the fridge!). The teacakes taste best toasted and then spread with a generous lick of butter (or peanut butter, which I insist on putting on everything). I've seen a lot 'frying pan' pizza recipes knocking around online lately, and I thought it was probably about time I tried to make my own. I am always in search of the best way to get the most authentic pizza experience at home (thin burnished crust, simple yet tasty toppings) and I feel like the high heat you get from the stove top/grill really helps to achieve that. I have used spelt flour here, for something a little different (I like the slight nuttiness that it gives), but a strong white flour would work just as well too. Add the salt, oil and most of the water and mix to form a dough (adding more water if it feels a little dry). Tip the dough onto a lightly oiled surface and knead for around 5 minutes, or until it feels smooth and elastic. When the dough is smooth, return to the bowl and cover with a tea towel. Leave the dough to rise, for around an hour, or until it has doubled in size. Meanwhile, prepare an oven-proof frying pan by greasing it with olive oil and sprinkling it with semolina. When the dough has risen, divide it into 4 equal pieces. Place one of the pieces into the prepared frying pan, stretching it out so it covers the base and the sides. Spread a couple of tablespoons of the passata over the dough in the frying pan, and then sprinkle over 1/4 of the cheese and 1/4 of the basil. Pre-heat the grill, to a high heat. Place the frying pan pizza on the hob on a medium-high heat. Cook the pizza for around 5 minutes, or until the topping starts to bubble and the base feels firm. Take off the heat and then place the frying pan under the grill, for around 5 minutes, or until the pizza crust is a deep golden brown. When the pizza is cooked, remove it from the pan. Repeat the process until you have used up all of the dough (any finished pizzas can be placed in a medium oven to keep warm until the rest are done). Served warm with a cold beer. My first memory of the beloved teacake is greedily chomping on one during a break time at school (you used to be able to buy them at a little tuck-shop they ran in the P.E corridor). They were absolutely huge things (or at least they felt like that to tiny hands), often tasted a little stale and were always dripping with butter. I created this recipe in honour of those school day treats, however these ones are slightly more refined and not in the least bit stale-tasting. 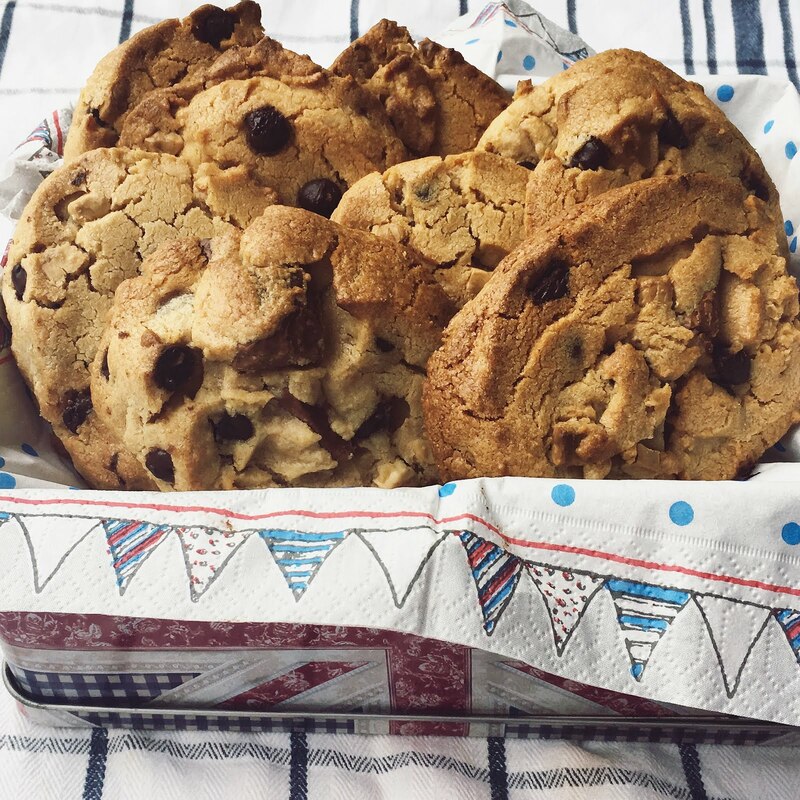 I have used spelt flour and honey in this bake, for added flavour and sweetness. You could add 200g of currants if you wanted, after the first rise, for something a little fruiter. 60g butter, plus a little more for melting. Place the flour into a large bowl and rub in the butter with your fingertips, until the mixture resembles fine breadcrumbs. Rub the yeast into the flour and butter. Add the salt, honey and milk and mix until it forms a dough (adding more milk if it feels a little dry). Place the dough onto a lightly floured surface and knead for around 10 minutes, or until the dough feels soft but not sticky. Return the dough to the bowl, cover with a tea towel and leave to rise for about an hour and a half, or until it has doubled in size. When the dough has risen, divide it into 8 equal pieces and then roll each piece into a ball. Place the balls onto a lined baking tray, leaving an inch gap between each one, and cover with a tea towel. Leave the balls to rise for around 30 minutes, or until they have noticeably puffed up and are almost touching. When the teacakes have risen, bake them for around 15 minutes, or until they have turned a light golden brown. When the teacakes are out of the oven, leave them on the baking tray and brush them with a little melted/softened butter and cover them with a tea towel until they have cooled (this will help keep them soft). These teacakes taste best on the day they are made, but will keep well for a couple of days in a re-sealable food bag. Best served toasted with lots of butter. This tart is one of those puddings that people would describe as a real 'adult' treat. The bitterness of the marmalade really compliments the sweet chocolate ganache and crumbly biscuit base. This tart tastes great on it's own, but you could serve it will a dollop of Creme fraiche, if you really wanted. Makes 1 medium tart. Serves 8. Grease a 20cm loose bottomed tart tin with butter. Place the biscuits into a food processor and blitz until they resemble bread crumbs. Add the melted butter to this biscuits, and blitz again, until the biscuit crumbs start to clump together. Place the biscuit mixture into the greased tart tin. Press down the mixture, with the back of a spoon, so that it evenly compacts in the tin and up the sides. Place the base in the fridge to set, for at least an hour. Once the base is set, spoon in 4 tablespoons of the marmalade, and evenly spread out. Place the chocolate into a large, heat- proof bowl. Place the cream into a pan and put on a medium heat. Cook until the cream starts to bubble. When the cream is bubbling, remove it from the heat and pour it gently and slowly over the chocolate. Whisk the cream and chocolate mixture, until all the chocolate has melted, and the mixture comes together. Pour the mixture on top of the tart base, spooning over the last tablespoon of marmalade when you are done. Place the tart in the fridge to set, for at least 3 hours, before slicing and serving. Keeps well in the fridge for 2-3 days. The honey in this loaf adds a subtle sweetness, whilst the oats create a lovely crumbly texture. This bake makes amazing toast, just simply slather with salted butter. Add the salt, honey, oats and water and mix to form a dough (adding more water if it feels a little dry). Place the dough onto a lightly floured surface and knead for around 10 minutes, or until the dough feels elastic. Place the dough back into the bowl and cover with a tea-towel. Leave the dough to rise, for at least an hour, or until it has doubled in size. When the dough has risen, place it onto a lightly floured surface and shape into a ball. Place the ball onto a lined baking tray, cover with a tea-towel and leave to rise for at least 30 minutes, or until it has noticeably puffed up. When the dough has risen, make a 'x' shape in the top with a sharp knife and sprinkle over a little flour and/or oats. Bake the loaf for around 25 minutes or until the surface is a deep golden brown and the bottom sounds hollow when tapped.